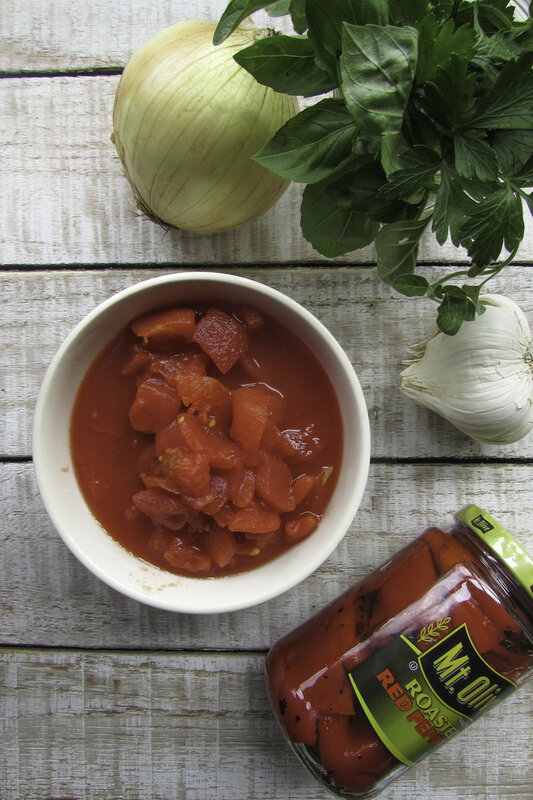 A marinara sauce with a bright and fresh taste that comes together in less than 10 minutes! This recipe takes advantage of some pantry staples such as canned tomatoes (high in lycopene!) and a jar of roasted red peppers. The roasted red peppers add a slightly sweet note to this sauce. Add the fresh herbs right at the end of cooking to keep their flavor intact. Serve this sauce over pasta, chicken or pork or as a dipping sauce with bread. Heat the olive oil in a medium size skillet over medium-high heat. Add the onion and cook until softened, about 5 minutes, stirring frequently. Add the garlic, diced tomatoes, salt and pepper. Cook for 2-3 minutes. In a blender, combine the tomato mixture and drained roasted red peppers. Pulse several times until combined but not completely smooth. Pour back into saucepan and top with basil. Serve immediately or refrigerate for up to one week.